The approach to Anazarbos today is via the Turkish village of Dilekkaya, which lies to the west of the ancient city. A guide or map is unnecessary as the citadel of this magnificent site abruptly rises hundreds of feet above the surrounding Cilician Plain and can be seen from afar. The history of this city preceding the Roman era is obscure. 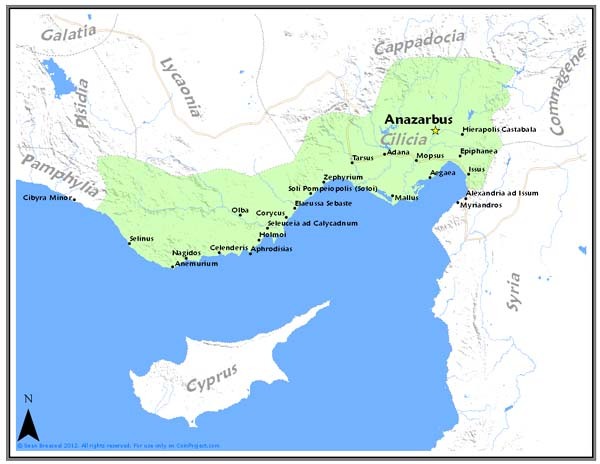 The first coins bearing the ethnic Anazarbos were issued during the second half of the first century BC, when Tarkondimotos I ruled most of eastern Cilicia Pedia and the western Amanus foothills. These few issues are the only coins of the city that are classified as "Greek". Three dated issues of the dynasty from that period reflect a regnal date beginning in 70 BC. One coin without ethnic issued by Philopator, son of Tarkondimotos, is dated year 34. A civic issue of Hellenestic type bearing a "Tarkondimotos II" monogram is dated year 51. A foundation coin bearing plow on reverse is also dated year 51 (19 BC). ` The dynasty temporarily lost its autonomy when Tarkondimotos was killed supporting Antony in the war with Octavian in 31 BC. Anazarbos was restored to the sons of Tarkondimotos in 19 BC and this event was marked by coins with the dynasty's Regnal date. The city was refounded as a Roman city, Caesarea ad Anazarbum, that same year and subsequent Roman Provincial coins bear an era date starting in 19 BC. Only bronze coins were struck at this mint. The name of the city is derived from the adjacent "mountain" of that name. It served for three centuries as a staging ground for Roman campaigns in the East, and issued a prolific series of Roman coins with commemorative themes, often related to games and imperial visits, up to the middle of the third century. After the capture of Valerian by Shapur the Great in AD 260, the mint permanently ceased operations.